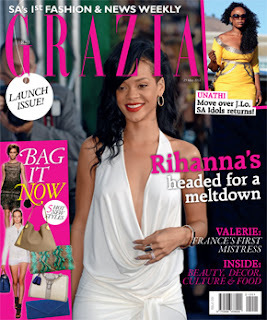 There’s a new fashion issue in town, if you haven’t heard about its called Grazia. It’s a weekly issue and it was first in stores on the 18th of May, yes I am a tad late but I wanted to see more issues to assist me decide if it was for me or not! Its target market is woman in their 30-something who are in the know and of course globally savvy......I may not be in my 30-somethings but I can relate to it. It's filled with fashion fashion fashion and more fashion as well as interesting features and no I am not being paid to blog about it but I love to give credit where its due, nice one Media-24!